Our Apprenticeship programs combine hands-on training with on-the-job experience. 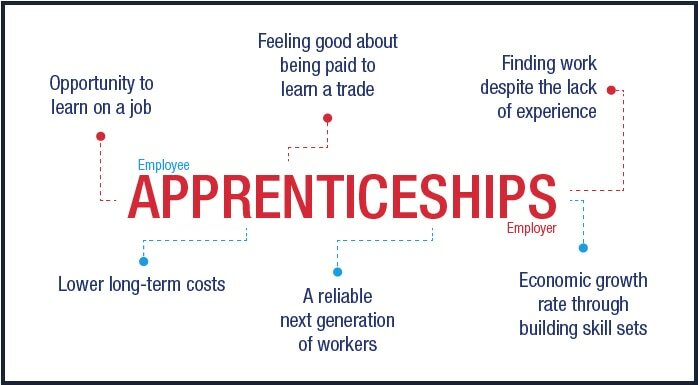 The "earn as you learn" apprenticeships provide opportunities that offer lifelong careers with family supporting wages and benefits. Union members must work hard, be reliable, and show up on time every day. ​Apprentices will receive on-the-job training from Union Contractors and will attend instruction (craft specific) at the SE WI Carpentry Training Center one week per quarter. ​1. Be at least 18 years old and legally authorized to work in the U.S.
​Graduates will have earned nearly $270,000 in wages, fringe benefits, health insurance, pension and education by the end of the Apprenticeship Program. ​The apprenticeship program typically lasts four years, about the same as a college degree. However, when you've completed the program you'll be earning more than many college graduates and there will be no loans to pay off! You get paid to learn and your training is free. ​After all of these previous steps have been completed, you will receive further information on in school training schedules and you are on your way to beginning your career! !